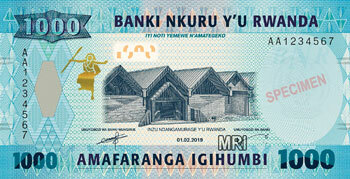 Rwanda – Pictures of the new banknotes. Pictures and details of the new banknotes to be issued next week have been published. 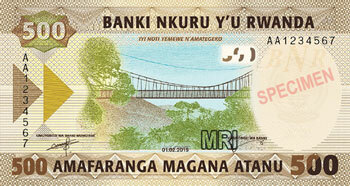 The 500 francs (RWF500.8) banknotes are brown, and show the Nyungwe canopy walk in the front, and three children using laptops. The 1,000 francs (RWF1,000.8) ones are blue, showing four houses on the front and a primate on the back. Both were printed by the G+D group in Germany.